My name is Todd Mitchell. I am personally banned from the benefits of the Google AdSense program for life. I’d like to tell you the story, though there are large portions of it I do not know, and I’d like to warn you about how easily this can happen to you too. Like any memorable nightmare, this one starts as a pleasant dream. A few years ago I found myself catching up with an old friend at a movie night where we discussed what we were up to as well as plans for the future. My friend lamented that his short run in retail had taken up much more of his life that he’d hoped. His dream, he said, was to one day join with an artist to turn several scripts he’d written into comic books and graphic novels. Eventually he wanted to run his own website where his work could be found and perhaps one day open a comic shop of his own. “That’s fantastic!” I told him. I shared an interest in this type of geeky pursuit and certainly encouraged those interested in writing at every opportunity. I asked what steps he’d taken and he said he felt stuck until he could establish a small web presence to attract artists that may be seeking exposure for their work. This seemed reasonable. He didn’t know a lot about my background so I told him a little about my areas of expertise. I shared some ideas about how to make such a site successful and I offered to help get him started. He was ecstatic. In the coming weeks we stayed in close contact and I’ll admit I became very excited by the idea as well. I’ve written a couple of scripts and outlines along the way myself and, with a variety of content ideas and access to artists, we could have a full-blown indie publishing operation on our hands in no time. We decided we would keep the initial cost low, we would write about interesting industry news and other geek topics of interest to generate some traffic, and simultaneously work on the development of one book each. We would publish online initially, print on demand, and expand as necessary. Done right, we felt the project could pay for itself. Before long we had a modest WordPress installation in place, several logos and headers designed, and we were even speaking with a couple of local artists interested in reading our scripts. I recall paying for at least half of the domain registration, hosting, and other expenses standing between us and the starting line. My friend was very eager to help but was not technical, and I had no problem with investing a little money and a good amount of time for a worthy cause. As we communicated with artists we happily wrote about everything from comics to video games and urban legends. My friend is a leading authority on the Gates of Hell here in the greater St. Louis area and his first post on this topic turned out to be the site’s most popular by far. We were doing what we loved and looking ahead with excitement. Comics, as it turned out, make for a brutal business for newcomers. To this day we have and cherish some great concept art we received from a variety of interested contributors but we never found artists who truly bought into the dream. They rightly wanted to be paid for their work. I’m the first to agree they should have been. We should have been too. That’s not how indie operations often work (it’s worth noting here that crowdfunding hadn’t quite yet arrived). Worse, we disagreed about how to make the best of things. After our first year I wanted to put together all the concept art we’d received, put together some facts and anecdotes about our journey thus far, and sell it for next-to-nothing so we would have our first product available and could raise a little revenue for reinvestment. My partner didn’t buy in. We were exhausted, disillusioned, and we argued bitterly. We parted ways and the site laid still as we went months without speaking. In time we reached out as friends do and made amends. We agreed that our initial plan could work, but it wasn’t working yet. We missed the fun we were having writing about general geek culture while we pitched artists and waited for their replies. 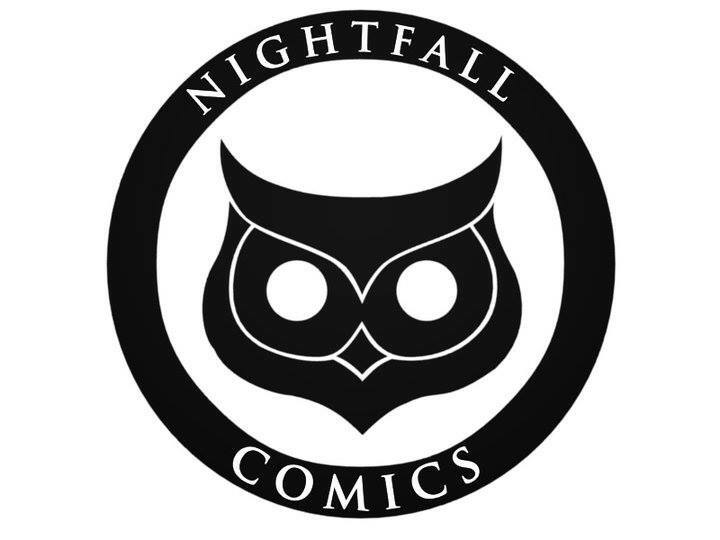 We quickly reached a decision that we would rather have the freedom of a broad geek culture site that may or may not launch comics of its own in the future. The spots we couldn’t fill with artists were quickly taken up by eager, talented writers. A very short time later we were editors of a geek culture news site with loads of potential. The dream had changed suddenly, but we were having a blast. 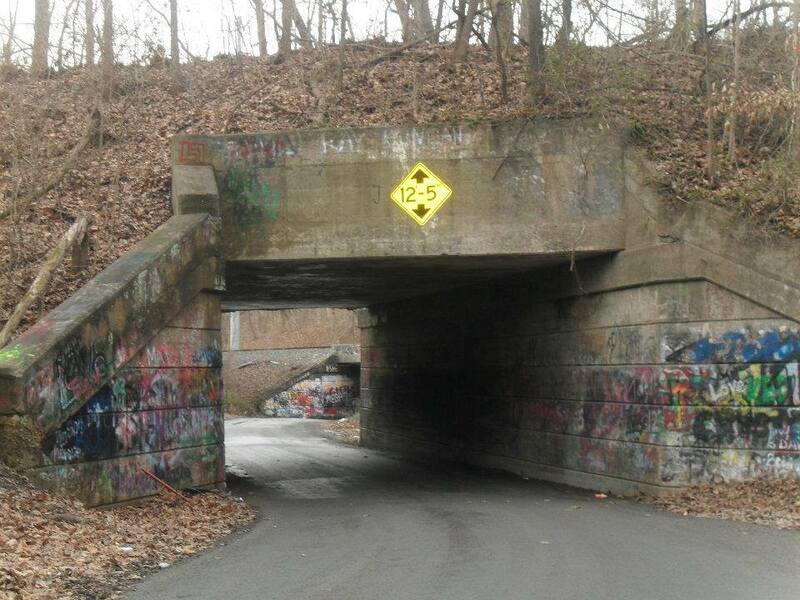 The Gates of Hell are just a few train overpasses. Sorry to disappoint. My friend and I found ourselves with a strong product on our hands and determined to focus on differentiating ourselves from the competition and find ways to monetize the site. Having already worked closely with a number of business and marketing grads at this point in my young career, I quickly volunteered to take the lead. I was eager to try my hand at building something from nothing. I wanted to make this work and reward the people who were already working so hard for us. I enrolled the site in a number of affiliate programs including Amazon and Audible (which we’d also promote in a new podcast we’d set out to develop) and I set up Google AdSense ads in strategic locations throughout our WordPress theme. I spread word throughout the staff: Do. Not. Touch. These. Ads. Nearly the moment I finished setting up our new stat tracking system the site saw its first post go viral. We saw a sudden spike in traffic and ad revenue and, I’ll admit it, I panicked. There was no way I didn’t mess this up somehow. Surely something was wrong. That’s when we started seeing the Gates of Hell write-up posted all over Facebook. Our best days saw tens of thousands of unique site visits pour in as our modest site strained to handle the attention (our host initially assumed it was a DDoS attack and shut us down until I called). I don’t have the numbers lying around anymore but I distinctly recall we beat a couple of small cable networks in views per day once or twice. Our AdSense account was off to a great start. We were well on our way to our first check. The podcast even got a jump start as listeners followed along during our moment in the spotlight. Morale remained high long after the viral wave subsided. Several staff writers very wisely adjusted their focus to give viewers more of the urban legend coverage they craved and readers responded well. The rest of the staff continued to branch out into all areas of geek culture and pursue new projects including specialty podcasts, site-wide challenges, cross promotion with other sites, and a variety of video posts. Everything we touched started turning to gold. The future grew brighter by the day. 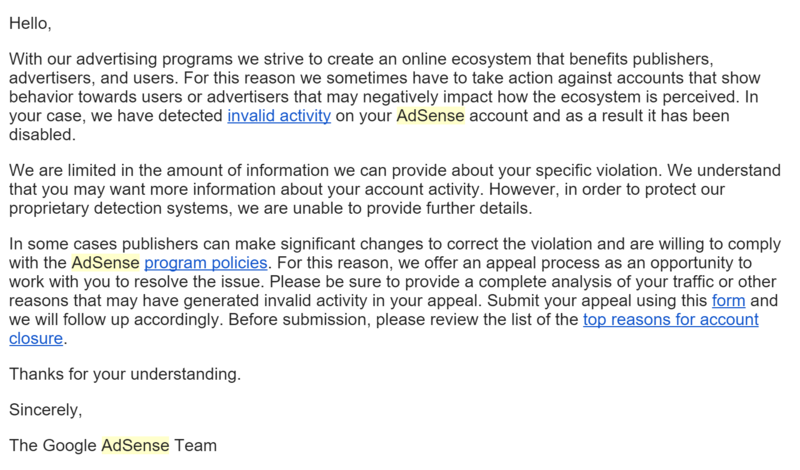 Then, at 8:41 AM on a Friday morning with no prior discussion, Google dropped us from the AdSense program. It may surprise you to learn I do not understand at all. Citing invalid activity on our ads, all our unpaid revenue (meaning all revenue period in our case) would be returned to its advertisers and we would no longer be allowed to participate in the program. No specific offenses were listed. My formal appeal was almost immediately denied with no additional information offered. I personally would never be allowed to participate in Google advertising programs again. My current account was immediately suspended, any future accounts I opened would be suspended, and any accounts opened by relatives or business partners of mine could be discovered and closed without warning at any time. I could never make money from another YouTube video again. The years of work were blown. The site shut down soon after. The money I’d personally invested would never be recovered. The completely unrelated professional work I wanted to do in the future was wasted in advance in the blink of an eye. Words like “angry” and “confused” fall short of the state I was left in. My staff was angry at me. I was angry at my staff. My partner eventually suggested he misunderstood the rules, saying his wife may have been occasionally clicking the ads, but he didn’t give me specifics. My appeals with Google were open and honest. Surely I couldn’t babysit every site visitor. Surely I can’t be held responsible for more than my own actions and the crystal clear instructions I gave my staffers. Google had literally no interest at all in working with me or explaining the exact problem. I tried appealing the suspension one last time last night, over one year after the initial notice. It was rejected before I woke up this morning with the shortest, most dismissive message to date. I reminded myself that my friends were not at fault; this is a bad business practice with victims all over the world. Accounts are suspended due to malicious ad clicking, accidents, and often with no useful explanation whatsoever. Any business partner who starts with a reasonable set of rules but absolutely refuses to listen to a circumstance or work with you to reach a resolution is a bad business partner, even if that makes Google a bad business partner. This is not said in bitterness. The proof is the moderately successful AdSense account my old partner now runs under his own name on a new site from the same network that may well have brought down the previous site. Has this rule protected Google’s advertisers at this point? Or has it just ruined a relationship with a capable AdSense partner? Beyond the defunct website I’ve stopped creating YouTube videos and I’ve sworn never to release any of my mobile apps to the Google Play store while this suspension stands. I’m just one guy. I can’t personally hurt Google, but I damn sure know the difference between right and wrong. Google got this one wrong. Have you been hurt by the AdSense program? Share your story in the comments. Since then I’ve opened a new account. Haven’t done much with it. If it starts earning money and I request a payout, I have no idea if they’ll honor it or not. Yikes right out of the gate! I think we were at about $92 and could have requested a check at $100. I have, the entire time felt responsible. Even if it was not me clicking the ad. I know you have and that only makes me more upset with Google. I certainly didn’t care for it. I didn’t blame anyone, well except Google. It is questionable practice to break an agreement without a valid reason. Yeah it might have been more accurate to say everyone was collectively pissed and no one knew what to do about it.